It’s been thirty years since Leah gave birth to her first child. She lies in bed with Anatole, talking about the “history of the world.” When the Portuguese first came to Africa, Anatole tells Leah, they were amazed by the Africans’ riches, but dismayed by the lack of agriculture in place. Leah enjoys hearing these stories, even though she’s heard them many times before. Over time, the Portuguese learn how to cross the wide rivers of the Congo, interfering with the lives of the people on the other side. We get the sense that Leah and Anatole have had this conversation with each other hundreds of times. The fact that they can continue to talk about the same things again and again reminds us how much pleasure Anatole and Leah take in each other’s company, and how equal and loving their relationship has always been. For ten years, Leah and Anatole have lived in Angola on an agricultural station. Angola is now an independent state. The village where Leah lives reminds her uncannily of Kilanga, and when she first arrived, she kept on expecting to see her old friends there. Her life in the village is hard but rewarding. She has to work hard to farm and grow crops. Leah and Anatole’s way of life in Angola is hard but ultimately better than Rachel’s: where Rachel savors her material wealth, but has no one to share her happiness with, Anatole and Leah take pleasure in each other’s company, and in raising a family together. Leah, out of all her siblings, seems to find peace in the simplest of ways: she forgives her father for what he did to her. It could certainly be argued that it’s easiest for Leah to forgive Nathan because he didn’t treat her as badly as he treated his wife and other children. But perhaps it’s also fair to say that Leah’s experiences in the last few decades—her decision to wait for Anatole, to nurture a family, etc.—have taught her that forgiveness and compassion is the quickest road to happiness. It’s also important to note here that Leah’s white guilt has lessened with the birth of her children—she is doing her own small part to make right the wrongs of colonialism and oppression. Arn, Jackson. "The Poisonwood Bible Book 6, Chapter 77." LitCharts. LitCharts LLC, 29 Jun 2016. Web. 19 Apr 2019. Arn, Jackson. "The Poisonwood Bible Book 6, Chapter 77." LitCharts LLC, June 29, 2016. 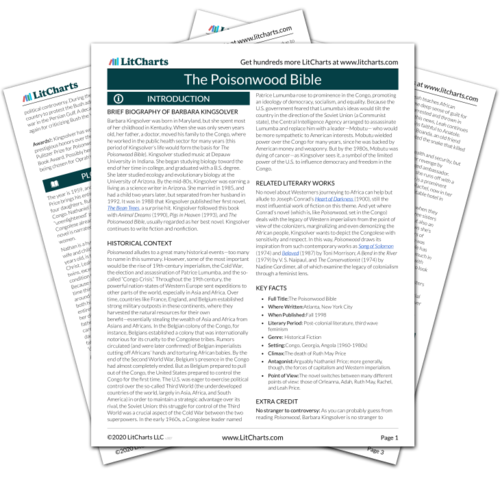 Retrieved April 19, 2019. https://www.litcharts.com/lit/the-poisonwood-bible/book-6-chapter-77.